We have been long time believers in only placing short video ads prior to long form content. For those not working in advertising (this post won’t be of interest) but it simply means that 15 sec max pre-roll video ads run before a piece of ‘significant length’ video content on a website, for example a 30 – 60 minute TV show. My opinion is that the experience for both the brand and the online consumer is much better by running ads prior to such long form video content. The rationale is simple: the mindset of someone settling down with a coffee or a beer to watch a show like Desperate Housewives online, is not the same as someone who is randomly surfing and who notices a short video of a chipmunk on a skateboard of say 20 secs in length. The trade off of seeing an ad prior to the very short chipmunk content is really not worth it in the eyes of most consumers and it is highly possible that they will be turned off both the site and the brand ad in such a case. 76% for 15 sec ads vs. 54% for 30 sec ads. In addition, the best part of the study shows that the video completion rate for both 15 sec ads and 30 sec ads when they run before long video content is approximately 90%, but only 58% for ads that run before short form video content. Youtube has currently prioritized the production of professional longer form content with some smaller production houses in the US because the vast majority of their huge amount of video in 2011 is short form content. Since they have the short form video market sewn up, they believe that they will be able to compete more strongly with Netflix, Hulu etc etc if they can add some professionally produced longer video content; also advertisers will find this longer content even more appealing for their brands. Clearly there are also creative challenges by creating short ads that need to tell a story and deliver the brand message in only a few seconds. The approach of simply airing 30 sec Tv spots as pre rolls is not optimal, although the tailor made online video messaging may need to be consistent in tone and manner with that of the Tv spots. 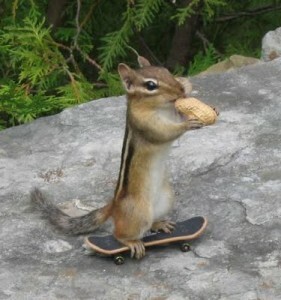 By the way, don’t get me wrong, chipmunks on skateboards are very cool, but less so for advertisers using pre rolls!